As part of our new user on-boarding initiative, we set out to fix some broken and legacy experiences in QuickBooks Online. We started by reimagining the subscription experience, but ultimately scaled back to a re-skin so that we could begin live testing on a new back-end platform. 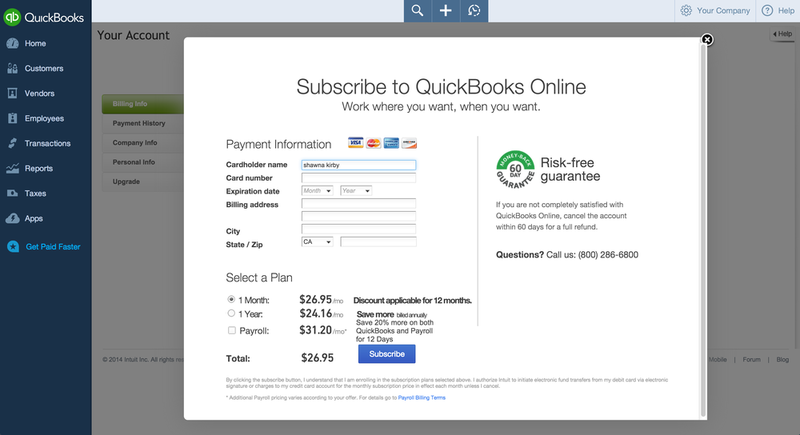 The existing QuickBooks subscribe experience. 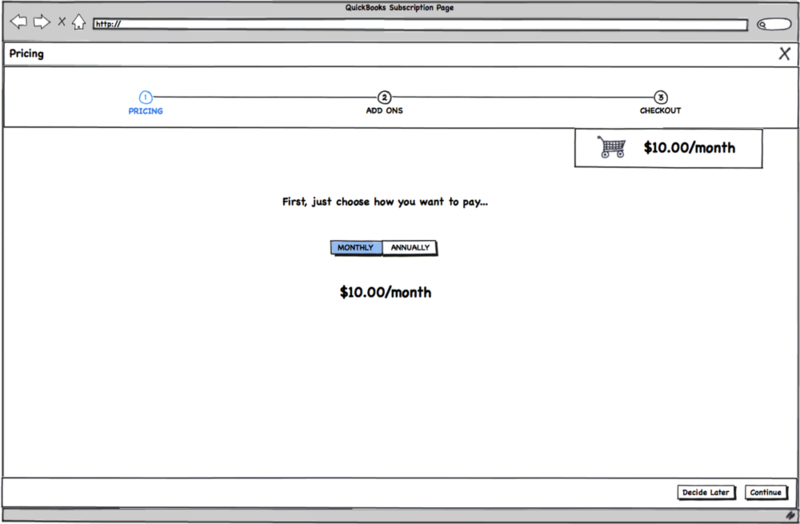 Built on an old platform and technology, the existing subscription experience not only felt broken and wonky, but it slapped users in the face with credit card info and barely explained what the user is paying for. 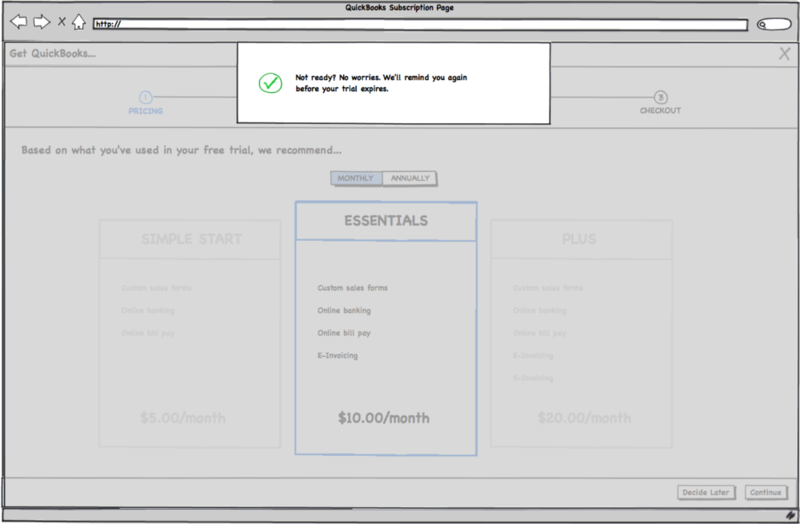 The subscription experience for trialers begins when the user opts into subscribe or the trial period has ended. The previous experience resulted in lots of care contacts because the experience of receiving a bill and seeing it on a credit card statement wasn't very thoughtful. The user would see discrepancies in amounts, multiple bills for different products, etc. Before jumping into the details of pricing, credit card info, etc., I took a step back to explore broad possibilities for reimagining the subscribe experience. I generated about 6 different concepts before narrowing down to truly differentiated ones. After narrowing in on a few of the best concepts, the team started trying to tackle some of the biggest problems. The experience would need to handle the complexity of multiple SKUs, multiple products, potential add-ons, and cross-product promos. And it would need to accomplish all of that without confusing the user! I worked closely with a visual designer to explore various layout options and visual treatments. Our goal was to bring a bit of surprise and delight to an otherwise transaction-focused experience. Here are a few of her explorations. Before resources were dedicated to build the entire experience, my visual designer and I recommended a final solution. Constrained by existing pricing models and promos (though we made a case for change), we recommended a 3 step flow that walked the user through confirming their "cart," entering credit card info, and receiving a confirmation. After some compromises and negotiations of scope and timeline, we launched the final experience below. Now that the new page is live and on a testable platform, we're continuing to iterate to make improvements!